It’s nice to see fake news is still alive and well in America! 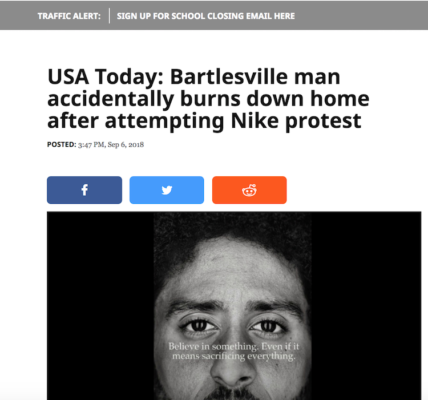 People across the country have been setting their Nike shoes on fire in protest against Nike, who recently made an Ad featuring controversial NFL star Colin Kaepernick and reading: “Believe in something, even if it means sacrificing everything… Just do it”. Officer Don Greenstein encourages people, “Don’t burn your Nike gear, just send them over to me”. Although I don’t think it’s illegal (yet) to accidentally burn your house down, I’d like to give the Macedonian teenagers who crafted this work of art a solid A-. Not only did they do a great job designing their fake news website – at a glance, it really does look like USA Today – but the headline is brilliant. It strikes that fine balance between attention-getting absurdity and believability that every fake news article needs. 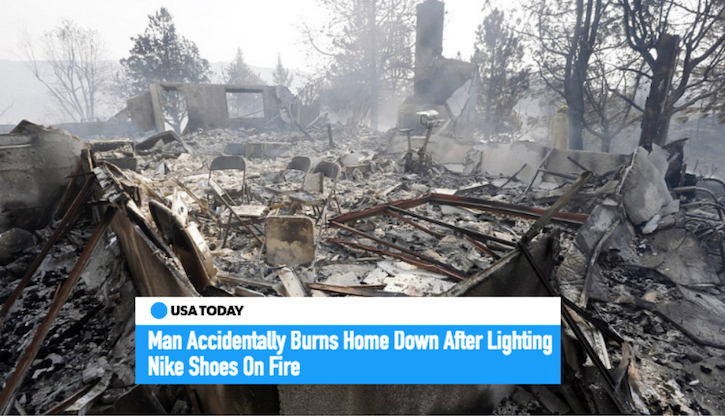 Oklahoma man sets fire to home while trying to burn Nikes??? Unless you have a level four or above B.S. Meter, who’s not going to fall for that? In fact, it’s so believable that KJRH in Tulsa took the bait. Not too long after KJRH reported the story on their website, they realized they were duped and took it down. That’s a classy move. It’s nice to know that they have a sharp, knowledgeable team of editors who are fast to act after publishing a very false story. One news outlet that didn’t fall for the ruse was the Bartlesville Examiner-Enterprise. They actually conducted real-life reporting to see if the story was true, and learn that it wasn’t. Bartlesville fire and police officials said Thursday a story circulating on social media about a Bartlesville man burning down his house because of a protest over Nike products is a hoax. Bartlesville Police Department Sgt. Robert Boals said the department has received several inquiries about the false story. “We have gotten calls from several TV stations about that, and it is completely not true,” Boals said. “We have not made any arrest or responded to any call like that.”..
Want to have some fun tonight? Call the Bartlesville Police Department and say you want to donate shoes to Mr. Greenstein. Previous post Elk City man brings horse shopping. For some reason this goes viral. I would not burn up comfy shoes for any politcal reason. I take it you would prefer using a rope? It would have been justified if it was a MAGA hat. – Really, truly knows that deep down, that their anger has nothing to do with veterans or the flag or “respect,” and are just angry at a black man protesting something they don’t like. Freedom….The 1st Amendment…is 1st for a reason. There is a gif that will be showing up soon, of a true patriot standing behind Agent Orange at his bund rally, just last night, showing proper flag etiquette – by wiping her snotty nose on it. ….but at least she isn’t kneeling! Damn! That’s quite a video. A Pulitzer for whoever took it. Yes, she isn’t kneeling. But more importantly… she’s white. So it’s OK. He and others were in no way PROTESTING THE ANTHEM. Please don’t spread this stuff – it’s bad enough when the MAGAbots do it. It is a protest against police violence against blacks and other minorities way out of proportion to treatment of white suspects. They kneeling is/was to raise awareness of this dichotomy of treatment. Thank you for the correction, I meant to say protest during the anthem. My mistake. Add to the list, in line for beer and hot dogs while the anthem plays.